There you have the Lowepro DroneGaurd CS 400 drone carrying backpack! I really enjoyed a lot of things about the DroneGuard CS400 but there were also a couple things that I think could be improved upon. 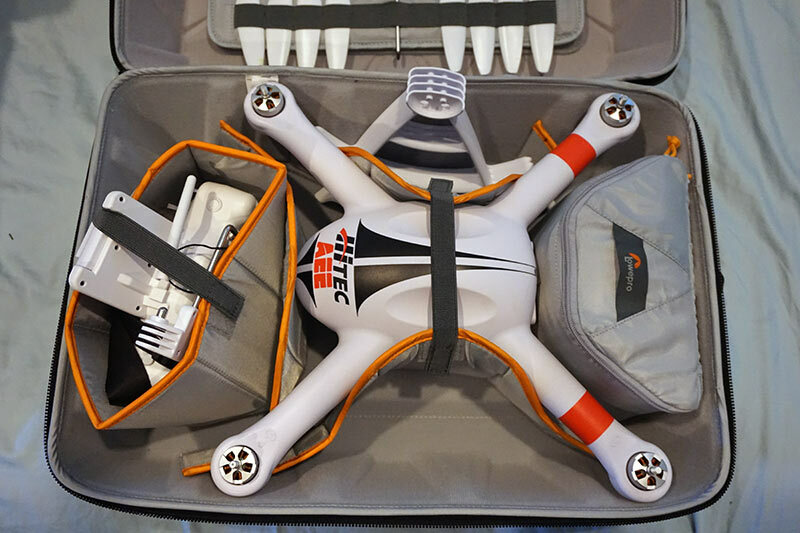 For one, after having used the DroneGuard CS400 for a while, I noticed that the bag will not stand upright on its own when you sit it down from holding its handle. The bottom part of the bag is not flattened in a way to make it easily stand which means you must lay it down every-time you sit it down. This typically isn’t a huge deal but if you are at the airport travelling it could become annoying very quickly. Another area where I think the DroneGuard CS 400 could be improved is with the zipper storage. There is one zipper storage on the outside but its too tight to fit anything but a thin notebook. This needs to be made of flexible material that allows for the pocket to expand when things are added. On the inside of the DroneGuard CS 400, it would be nice to have a zipper pocket or two along the outside edges. These smaller zipper pockets could allow storage of memory cards, small manuals, or maybe even a pocket size notebook for flight tracking. Other than these two items, I feel that Lowepro did a great job on this carrying case for drones. Their quality of workmanship and attention to detail is definitely seen in the product and with a couple extra modifications this bag could be hands down the best all-around bag on the market today. I was very surprised at how light the bag is but at the same time the exterior with its egg crate style design, seems very rugged and able to protect the contents within. Special thanks to Lowepro for sending us this DroneGuard CS400 to review! You can find out more about this product and purchase one directly from Lowepro at their product page. 85% Good Backpack Style Drone Case!